There are numerous suspicious programs roaming the web these days. One such program is known as Unfriend Monitor. 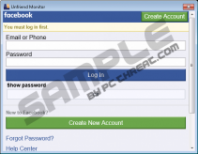 Due to its suspicious and invasive functionality, this application has been categorized as an adware program. On its official website the user is greeted with a statement that this tool can help you view the people that have unfriended you on Facebook. Unfortunately, it has been found out that quite a few users have been tricked into downloading and installing this intrusive ad-supported program due to such misleading marketing. Make sure to avoid Unfriend Monitor at all times as it holds not beneficial features whatsoever. Do not hesitate and use the removal instructions that we provide below to delete this invasive ad-supported program in a quick and easy way. Make sure to read this article to learn how you can identify this intrusive program. 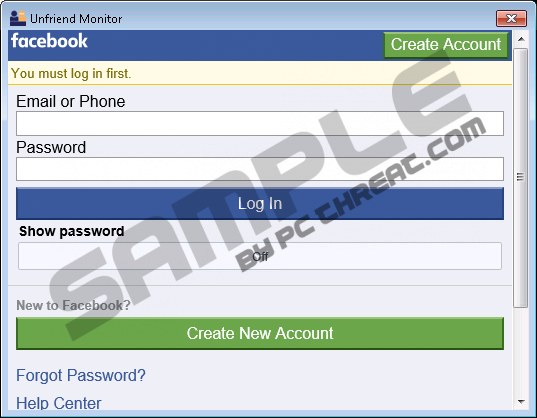 The primary indication that Unfriend Monitor is active on your PC is an abnormal functionality of your web browser. Once this ad-supported program is up and fully running on your PC, your web browser will get filled with a ton of unwanted third-party web content. This is so because the adware application initiates various connections to adware servers that are the primary source of unwanted web content, which in most cases is presented you as various banner ads, coupons, and pop-ups. Such activity promoted by this adware will ruin your online activity since at times your web browser might get filled up so much that you will be forced to fight your way through them just to be able to navigate through the web. In fact, surfing the web the way you are used to will be virtually impossible as long as this ad-supported program is active on your PC. Only a thorough removal of Unfriend Monitor will stop the activity that it provides. If you fail to do so, the annoying ads and pop-ups will continue to bother you. Even though, the annoyance caused by this adware program is extreme, something much more alarming about Unfriend Monitor. During the research, it has been found that in some cases you might be provided with ads that contain redirect links. This is a dangerous instance, to say the least, since just by clicking on a simple ad presented by Unfriend Monitor you could end up on a suspicious third-party website, which might be running an arbitrary code execution exploit. This means that just entering such a website is well more than enough to get your operating system infected with some other malware. Avoid such instance by conducting a complete removal of Unfriend Monitor right now. The removal procedure should not be delayed as Unfriend Monitor could turn out to be a major virtual threat. Do not skip any steps while conducting the removal process because just a single mistake could mean that the adware program was not removed. This is why we advise you to scan your operating system with a reliable antimalware tool as soon as you have executed the manual removal, because it is the best way to be sure that nothing associated with Unfriend Monitor is active on your PC. Quick & tested solution for Unfriend Monitor removal.